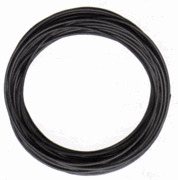 Please contact us by e-mail for price and availability on the tubing. Other sizes, lengths and colors are available. Please contact us by e-mail for price and availability. O.D. O.D. I.D. Wall Min. 1120-4A-BLK 1/4 .250 .170 .040 1200 100 ft.
1120-6B-BLK 3/8 .375 .251 .062 1400 100 ft.
1120-8B-BLK 1/2 .500 .376 .062 950 100 ft. Temperature Range: -40°F to +200°F (-40°C to +93°C).